Distant Smoke begins her tale by setting the scene on Page 2 of The Peacemaker and the Tree of War. The Kanonsionni were not always the great confederation that they have become. It was a trying and difficult time for the Kahne’aké. 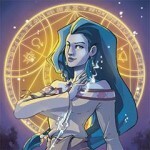 I still don’t have an incentive yet for Top Web Comics. Kristin is drawing as fast as she can to keep us up to schedule. But you can always vote for us anyway and read Kristin’s webcomic Sylvania as a reward! A less than gentle reminder that peace has been the exception, not the norm, for most of recorded history, and has been for ALL peoples. my people are proudly pro-peace, with a minority percentage exception; we are not berated by anyone and if any among our number strikes out, he is punished to the full extent of the law. our ‘enemies’ attack our civilians simply because we are Jews and their religious and political leaders preach hate and violence. the few among our attackers who speak for peace are not merely called cowards, but are threatened with death, or in fact, killed alongside their families, as punishment. what if they were merely called cowards and NOT killed for speaking up for peace with us? then, peace might flourish. THAT IS to say, from my point of view, just being called a coward, but no worse would be such a blessing, for someone whose nation has TRULY lost it. This was my immediate association too. An endless cycle of war from which nobody sees peace. Jews dream of peace with their neighbors more than any other part of the world, and people do not (or refuse to) understand that those neighbors are not after peace, they are not after sharing or trade or making the land thrive. All they are after is power and death of people who want to live. What kind of a life is living in war? It’s a life of being afraid to work and bring food to your children when any fanatic could jump up and attack you anywhere just because you EXIST. When at any moment blood might be spilling somewhere you thought you would be safe in, those who want peace bear not only the burden of appearing weak or naive, but also the lives and deaths of their kin that are wasted in vain because rather than finding a solution to their problems people try to find somebody to blame besides themselves, to conceal the horrors of murder behind promises and lies. On topic, I sincerely want to see this vignette to the end, learn WHY the Kanonsionni are feuding, And what do they do to end it. It might provide even a drop of insight, a touching allegory, or even just a good to make people think of things.Too early to say, I’m certain, but at least it will be interesting, and I really like the artwork, my compliments to the artist! yes, agreed on all points – even the art is perfect. What you say may be true for the modern Jews, I’m not gonna go in for that debate here (or anywhere: way too volatile), but this was not always the case. In the old stories, they were just as blood-thirsty as anyone else and saw their slaughter and enslavement of other people as justified because they were god’s chosen. There is no human culture that is blameless when it comes to such things, with the exception of those very very few who developed under total or near total isolation (an exceptionally rare situation). It’s just human nature to biased in favor of ourselves and seek to improve our lot at the expense of others, be they non-human or humans that we see as different. We’ve gotten better, primarily because we can afford to be (we’ve gotten better at finding resources and using them efficiently, now we’ve just got to work on doing so without causing further harm to the planet). The goal might be peace and prosperity for everyone, but we’re still a very long way from that. I was inspired by the stories of the Great Peacemaker for this vignette. A desire for peace and the trap of war is something that could be found in all cultures. I thought the message of this story transcended its origin and was applicable to many people and many times. That’s a sign of an excellent story. Nicely done, Haudenosaunee. I too am proudly pro peace, shame my neighbour still won’t accept peace with me. Just because I took half of his garden, the best rooms in his house, restrict his water supplies and his access to supplies does it really mean he has to be against me? Some people would really use any stupid excuse to make war. Thank you for speaking my heart. Often we are not aware of the atrocities our governments commit in the name of our own prosperity. However, enemies do not spring from the dust, born with hatred, and there is often suffering to be addressed. It sounds like I do not live in the same country as spas, but I say the same of my own, and that I would be hard-pressed to inspire agreement among most of our citizens that we are at fault for so many sorrows in this world. Indeed, it it is one of the great universal stories, one that has influenced our world to this day. Hmm I’ve seen this somewhere I think…..AHA! 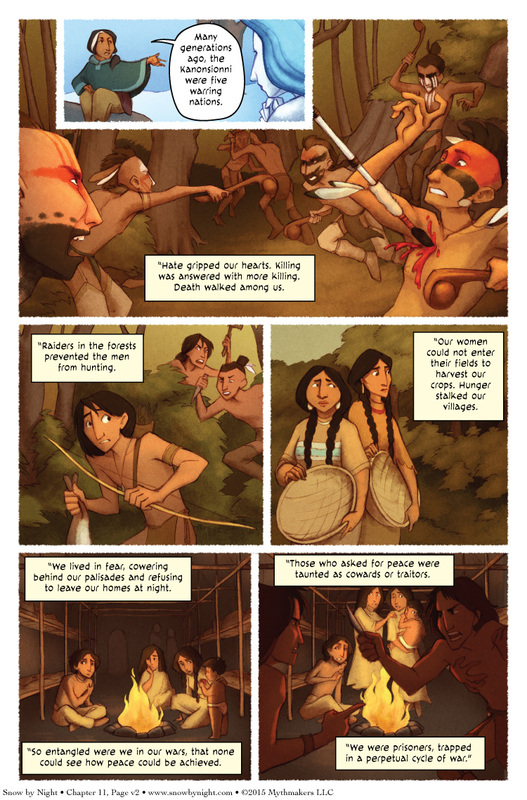 Yes, I did state on the first page that this was adapted from the Haudenosaunee legend. I didn’t see this particular video. I drew from a number of other sources that recounted the tale.